Chemical Composition:: TiO2, BaO2, SiO2, ZrO2, Etc. All weather Ceramic Beads can improve road safety grade, It's the normal reflective beads upgrade products, usually we name it All Weather High Reflective Glass Beads,wet Night Reflective Glass Beads. Most Efficient Optics for Liquid-applied Markings. Each Rainy Night Reflective Glass Beads is a complete pavement marking optical systemcomprised of microcrystalline ceramic beads, binder and pigments. Easily Installed by Double-drop Systems As the first drop of a double-drop system, the All Weather Reflective Glass Beads. Provide visibility to motorists in both wet and dry conditions.Thermoplastic Paint Glass Beads, All-weather Rain Night Reflective Glass Beads are effective as either new marking applications or as part of a maintenance marking application. Our High Reflective Night Reflective Glass Beads apply to different road marking paints and fuse effectively, no matter with the domestic general hot-melt traffic paint or gradually appeared two-component reactive waterborne coatings or cold spraying paints. Ensure following requirements during road marking construction: ensure our All Weather High Reflective Glass Beads subsidence to 50%-60%, sinking too deeply will waken retroreflection coefficient, sinking too shallow will cause adhesive problem. Ensure us all weather reflective glass beads 180-200g/m3 during construction. Looking for ideal Rain Night Reflective Glass Beads Manufacturer & supplier ? We have a wide selection at great prices to help you get creative. All the Thermoplastic Paint Glass Beads are quality guaranteed. 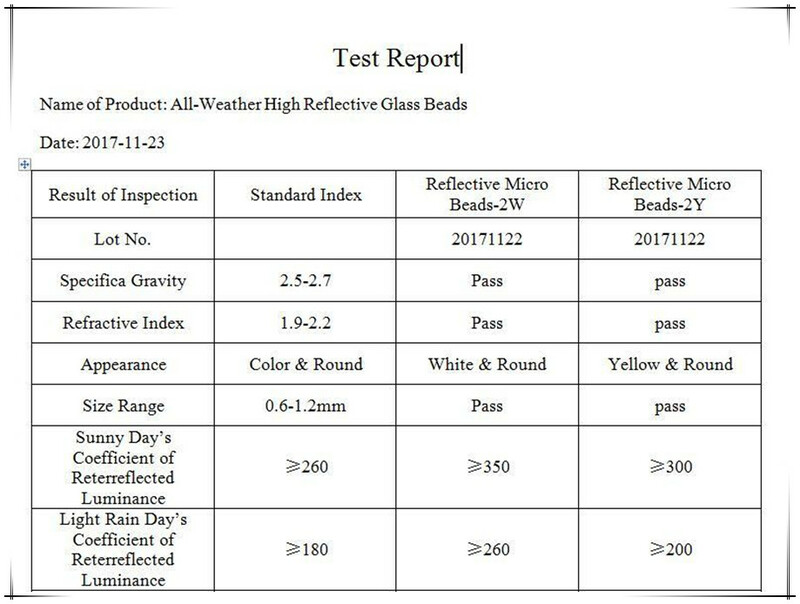 We are China Origin Factory of All Weather Reflective Glass Beads. If you have any question, please feel free to contact us.